Our third and last meeting of the year was held on Wednesday 17th October. We had a strong turn-out with 20 people attending. A brief list of the cases presented is given below. Nodular Pinnal Dermatopathy in Kittens – Ann Hargis and Jaco van der Lugt of the International Society of Veterinary Dermatology kindly allowed presentation of their cases. 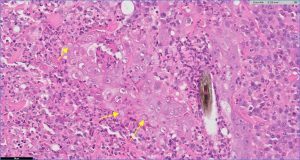 Eosinophilic folliculitis and furunculosis in a dog associated with leptospirosis. – Kate Murphy and David Shearer kindly allowed presentation of their case material. Generalized calcinosis cutis associated with probable leptospirosis in a dog. Vet Dermatol. (2005) 16(6) pp 401-6. Two uncommon manifestations of leptospirosis: Sweet’s syndrome and central nervous system vasculitis. Asian Pac J Trop Med. (2011) 4(1) pp 83-4. Sertoli cell tumour in the scrotum of a castrated dog. And seminoma in the inguinum of a 2 year old castrated cat. Unusual epithelial lined cystic structures in the abdomen of a cat, associated with omentum adjacent to spleen and pancreas. The differentials of mesothelioma, carcinomatosis and duodenal pancreatic heterotopia, particulary Type 3 when mostly ducts are present, were discussed. Bilateral optic nerve malacia in a mule. The cause was unknown but trauma is a well recognized cause. A viral plaque in the cornea of a dog. 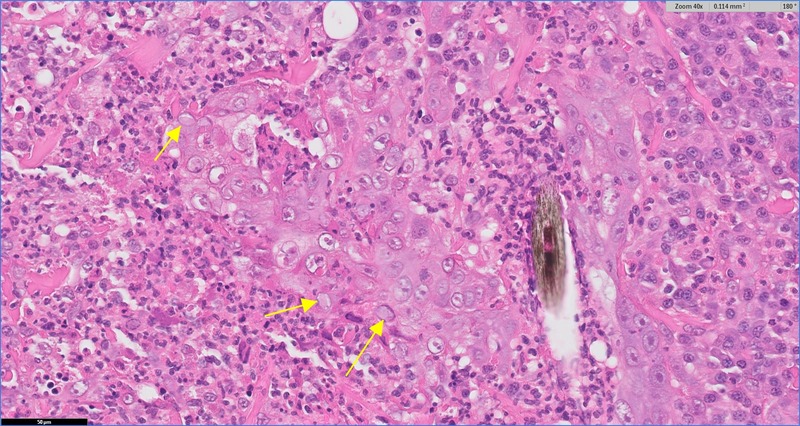 Concurrent lymphoma and Leishmania onlymph node cytology from a dog. Neoplastic cells lining the inner aspect of the iris in a dog. The differentials of metastatic carcinoma versus primary iridocilary tumour were discussed. Osteosarcoma developing in a gossypiboma in a dog. Synovial lipomatosis in a dog. And some very nice examples of cutaneous herpesvirus in a cat with some lovely inclusions. A GIST in a cat, cutaneous leishmaniasis in a dog and botryomycosis in the skin of a cat due to Staph. aureus. A fibrovascular benign cutaneous nodule likely angiofibroma in a dog. A collision tumour in the urinary bladder of a dog (tcc and hemangiosarcoma). An odontogenic tumour with squamous differentiation and desmoplasia in a cat – desmoplastic ameloblastoma.